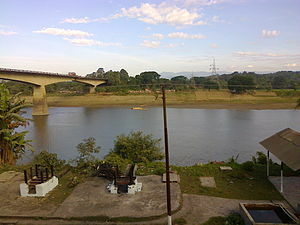 The Barak is a 2,000 km river flowing through the states of Nagaland, Manipur, Mizoram and Assam in India and into the Bay of Bengal via Bangladesh. It is being developed as one of the Inland waterways of India. Its drainage basin covers 880,000 sq km (340,000 mi). The environment of Barak's basin hosts a wide variety of flora and fauna. From its source at Liyai Kullen Village in Manipur state of India wherein the majority of the local population belongs to the Poumai Naga tribe, the river is known as Vourei. Near its source, the river receives a lot of streams, including the Gumti, Howrah, Kagni, Senai Buri, Hari Mangal, Kakrai, Kurulia, Balujhuri, Shonaichhari, and Durduria. It flows west through Manipur State to Nagaland, then southwest to Assam where it leaves India and enters Bangladesh at Bhanga Bazar. In Nagaland State, the Barak flows southeast then veers sharply south when joined by south-flowing streams and flows into Manipur State where again it turns westward again near Chandel district at Delta Sunderban before emptying into the Indian ocean (bay of Bengal). Barak is among the richest rivers in the world in terms of aquatic biodiversity, as it contains more than 2,000 species fishes including Neon tetra. Other creatures include River Barak crocodile, or Siamese crocodile (a rare and endangered crocodilian), Susu dolphin, Smooth-coated otter, and the black mugger, an alligator. The principal tributaries of the Barak are all in India and are the Jiri, the Tlawng, the Longai, the Madhura, the Tuirial, the Rukni and the Katakhal. Tipaimuk project is on the process on Barak river. From its origin, down to its bifurcation at the border of Nagaland into Surma river and Barak river, the Barak River is 564km (1864 mi) long. The biomes are extremely rich in wildlife and also very diverse in the entire stretch of the river including: 1. Varzea forest ( flooded rainforest) 2. Los llamjao (flooded grassland and Savannah) 3. Tidal forest (Mangroves in vast Delta Avourei) 4. Flora or vegetation of the Pats ( flat-topped table mountains in India and western Cambodia) 5. Huge Tropical swamps. ^ "Barak and others". nrsc.gov.in. Water Resources Information System of India. 27 October 2015. This page was last edited on 10 April 2019, at 06:16 (UTC).